Chhattisgarh Board Result 2019 - Chhattisgarh Board of Secondary Education (CGBSE), Raipur is responsible for declaring the Chhattisgarh Board Result 2019. The CGBSE Result 2019 comprises of both CGBSE 10th Result 2019 and CGBSE 12th Result 2019. CGBSE is expected to declare the CGBSE 10th result 2019 and CGBSE 12th result 2019 in the second week of April. If previous year trends are to be believed, the Chhattisgarh Board exams 2019 are likely to commence in the first week of March and will continue up to first week of April. 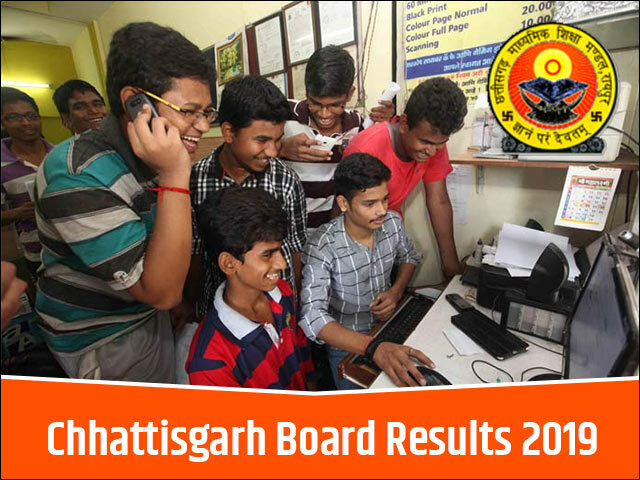 Chhattisgarh Board Result 2019 will be announced online on its official website- cgbse.nic.in. JagranJosh will also be sharing the links to check Chhattisgarh Board Result 2019. Students are advised to visit this page for any information related to the CGBSE Result 2019, as we will be covering every latest news and updates on the same. Students can bookmark this page to get quick access to any latest news and the Chhattisgarh Board Result 2019. JagranJosh brings to you complete guide on the CGBSE 10th Result 2019 and CGBSE 12th Reuslt 2019. How to check Chhattisgarh Board Results 2019? If candidates find the official website to be slow and sluggish, they can alternatively check their CGBSE 10th Result 2019 and CGBSE 12th Results 2019 on this page. The students will also be able to download their CG Board 12th, 10th Result 2019 scorecard from here. The analysis of Chhattisgarh Board Result 2019 will be done after the results are declared. As per the previous year trends, the CGBSE Result 2019 is expected to be out by second week of May, 2019. For now students can go through the previous year stats to get a hang of the difficulty level of the board exam with the help of overall pass percentage of Girls and Boys. According to a report, in 2018 over 6 lakh students had appeared for the CGBSE 10th and 12th examinations. In 2017, a total of 4, 42,060 registrations were received for the CG Board 10th examination. In 2017, a total of 2, 79,906 registrations were received for the CG Board 12th examinations. What after Chhattisgarh Board Results 2019? After the Chhattisgarh Board Results 2019 are announced the most crucial thing to do is to access the result and download the CGBSE Results 2019 or take a hardcopy of the same. Although the students will be provided the facility to download and to take a printout of the CGBSE 10th Result 2019 and CGBSE 12th Result 2019 scorecard, they must remember that these are merely provisional results. The students are informed by the CGBSE that the online score cards of the CGBSE 10th Results 2019 and CGBSE 12th Results 2019 will not be considered in place of original, and are provisional. The students should download the Chhattisgarh Board Result 2019 on their system only for offline viewing, and to be used as a reference for admission formalities. Authorities will always ask for the original mark sheets issued by the CGBSE to corroborate the online / printed scorecard before completing their admission formalities. When the CGBSE Result 2019 is announced, it will bring joy to some and disappointment to some. However, students must know the results are not an end to their dream. In case the students do not feel that their efforts have been truly justified in the scorecard, they can apply for re-checking / re-evaluation of the answer sheets. In case there is any change in the final mark tally, the same would be updated in the original mark sheet. There may also be cases where a student has unfortunately failed in the exams, he will be provided with another opportunity to prove himself. The student will be able to appear for the compartmental/ supplementary exam. The supplementary examination may be scheduled to take place in the month of June. The same will be notified here in this article and also by the board on their official website. Students are advised to bookmark this page for any update on the Chhattisgarh Board Result 2019, they can also fill in their details on the link shared in this article to receive notification in regards to the CGBSE Results 2019. The Chhattisgarh Board of Secondary Education (CGBSE), Raipur has declared the class 10th and 12th board exam datesheets on the official website i.e. cgbse.nic.in.